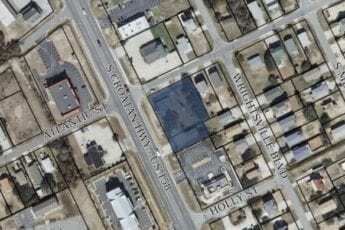 Plans for a 100-seat restaurant in Kill Devil Hills have hit a snag over a driveway that would provide access to U.S. 158. The town’s Planning Board recommended Tuesday that the Board of Commissioners reject the proposal. Submitted by I.G. Holdings, the site plan calls for using an existing entrance to one of two lots that would be combined for a 3,000-square-foot building on 27,750 square feet of land. For safety reasons, a town ordinance prohibits access from U.S. 158 or the west side of N.C. 12 on corner lots that can be reached from a side street. Town Attorney Casey Varnell confirmed the town staff’s assessment of the restriction. The lot at the corner of Atlantic Street used to be Advanced Tree service. The one next to it has been various businesses, most recently Bizport. Both buildings have been torn down. John DeLucia with Albemarle & Associates engineering argued that the driveway already existed and that other projects on corner lots have been allowed access to the two thoroughfares. He pointed to the Marriott hotel project on the Beach Road as an example. Although the driveway originally was not a corner lot, the combined parcels should be considered as one for purposes of the site plan, according to Varnell. DeLucia said after the meeting that the price for the land included the U.S. 158 driveway and would be worth considerably less without it. The Planning Board is an advisory panel and the Board of Commissioners does not need its endorsement. If commissioners turn it down, the same plan cannot be resubmitted for three years. A different plan could be considered, however. Without U.S. 158 access, DeLucia said, the entire plan would need to be reconfigured. He would not say what kind of restaurant might occupy the building. Really? I can name several businesses on a corner lot on 158 with access from both 158, and whatever side street they are on. QP, Burger King, Wendy’s, 7-11, Ladles, and I could go on. Or is this a “new” ordinance? The issue at hand is that the driveway was not part of the original corner lot. I can foresee southbound traffic clogging the middle lane and not allowing northbound traveling residents to make a left onto W. Atlantic to get home. Southbound traffic already interferes with northbounders wanting to make a legitimate left in a “Left Turn Only” lane at Mama Kwans (Ocean Acres) and the Shell Station (Baum St.). Crush this proposal! Would Mr. Delucia Please name the street that the Marriot is on the corner of?? It appears somebody did not do there homework or figured they could slick talk there wishes on the Planning Board! What exactly does the bypass actually bypass? Next there will be another traffic light there like McDonalds has for themselves. its not the county making the decision. Now is it still typical? The beach road is the actual bypass.